These conversations with the Mother, originally held in French, were noted down from memory by Mona Sarkar. They took place from 1959 to 1968, and covered such topics as the Mother's way of working with sadhaks, the different nature of the experience when people met her in her interview room, her work to reveal the divine harmony behind appearances, her relation with her own Mahasaraswati aspect, the power of Sri Aurobindo's presence one feels in his room, and the new consciousness that descended on earth in 1969. The last fourteen pages contain the Mother's written answers to questions Mona had submitted to her in his diary in 1951. The book contains many photographs of the Mother and facsimiles of her handwritten notes in the original French. 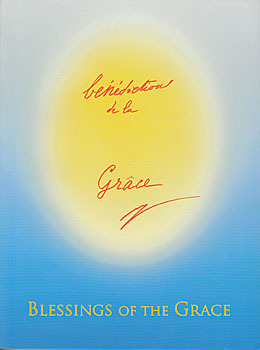 Bénédictions de la Grace. Let's begin with the significance of Grace given by the Mother to the flower she called Divine Grace: "Thy goodness is infinite; we bow before Thee in gratitude!" However intense and deep our devotion be, however humble our gratitude, we can never fully conceive the grandeur and magnitude of the Divine Grace that is constantly showered on us. We are bathed and inundated in its ineffable flow. Very often when we read what Mother has written to one of us, we feel in our purer moments of sincerity that She is addressing all of Her beloved children, Her chères enfants. The breath of divinity is "upon the waters of our being", and we too are privileged and blessed. So here, reading this book with a consciousness aspiring to become "intimate and one with Her", we reap a rich harvest of moments lived in closeness to Her. Her fragrant Presence permeates and pervades the entire book, and when She speaks of the Lord, one feels His radiant Presence. It is praiseworthy of Mona Sarkar to be able to recollect and record from memory so many precious revelations, elaborating what Mother has confided to him. Thanks to his generous sharing of these treasures, we are blessed. Her injunctions to one, are they not also addressed to all aspirants? Let's express our joy and gratitude. If one has faith, a faith that comes from there (the heart), a true faith, then the light cannot disappear.…If one is tranquil and armed with this faith, faith like an intangible sword…which rises straight up without wavering, well, with this one is always enveloped by my light. Our Mother is above time and space. She explains: "[F]or us, where the world is a field of action, one must widen the consciousness and be in touch with the universal consciousness and abandon oneself completely to the Divine—the action, the work and everything. Then alone one can perceive gradually the action of the Eternal and Infinite." Later she talks about the vibration which was at the origin of Creation: "At first, there was a vibration. The Supreme sent forth a vibration which by variations took the forms to create this universe." She goes on to reveal that Savitri and Prayers and Meditations have "the same intensity of vibration and rhythm, the same origin, the same intuition, in fact, the same revelation with the power to transform." His presence vibrates, concrete, all around the Samadhi. And His influence penetrates and touches the central being and awakens the consciousness to the spiritual life. Even those who come out of curiosity to visit the Samadhi, return "amazed by a mysterious alchemy and find an inner peace, because there He showers His peace and His compassion constantly. It is this that bathes them when they pass before Him. It is an unbelievable surcharged activity of His force and His Presence. When I look at the Samadhi and see what is happening there, I am astonished to find this column of dazzling light vibrating with an energy and a transforming force.…It is the New Light materialising. At night, when everything is quiet, there are some entities who clean up this place of all that the people have left behind – all the formations of falsehood, desires, impatient supplications, all sorts of complaints, bad-will and maladies, as well as hostile forces – and make this place peaceful and pleasant. They purify the whole surrounding with so much love so that His presence is felt. In the chapter "Sri Aurobindo in the Subtle Physical" she says: "Each day there are thousands who die and many others who are born.…Sri Aurobindo is occupied with all this. He is in the subtle physical and constantly people who die come to Him and also He decides who will come back.…He is preparing souls who shall reincarnate." Whereas [in the interview room], it is absolutely different, because it is not I who see here but the Lord.…here it is not I who am presiding but the Lord. Before calling in the people, I concentrate on the Lord. And when He appears, I go behind Him, as behind a veil, and I give Him the whole charge of the morning for meeting people…let them live in the Peace and the Light of the Lord. And saying this, I offer everything to Him and I go behind him like someone who witnesses. And from that moment, it is He who presides…he envelopes all with His love and His compassion.…He bathes them in His atmosphere, so that people can live in the Peace and the Light. With Her promise of constant support, help and encouragement we feel entirely safe on this venture, securely wrapped in Her Presence. This quest is a unique adventure with inexorable difficulties and ineffable recompenses. Once we have accepted to tread on this path, we must be ever alert, look into ourselves and scrutinise, and march on ever forward, for Her "outstretched Hand is felt upon our lives". In a persistent purification and surrendering with faith to the Guiding Presence our days "become a happy pilgrim march". And yet She enjoins us to be patient, determined, sincere, honest and transparent. She warns us against subterfuges, darkening shadows, pretence, arrogance and lack of humility for, in the words of Sri Aurobindo, "All insincerity of nature, once thy defence against the eye of the Master and the light of the ideal, becomes now a gap in thy armour and invites the blow." Nirata-di came to Pondicherry as a child and joined the Ashram's school in early 1945, the second year after its foundation. Since 1959 she has taught English and later painting at the Centre of Education.